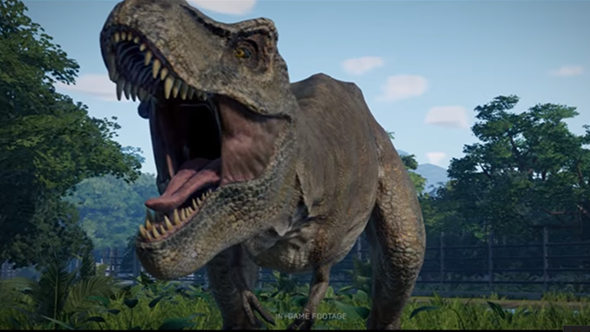 Jurassic World Evolution will release on June 12. A leak from a press event in Los Angeles confirmed that the Jurassic Park tycoon game will release in the summer. Jeff Goldblum is in Jurassic World Evolution. We already knew that Jurassic World Evolution was set to launch during Q2 or 3 this year, but the leak, which you can see below from AllGamesDelta on Twitter, confirms that it will launch in June. We had sort-of guessed this, since that’s within a week of the release of the next movie in the franchise – Fallen Kingdom – but it’s always nice to have it confirmed. AllGamesDelta says that the event took place at the Universal Backlot in California, but further footage from the event is not yet available.